Victoria Fisher inserts ballots into ballot machine at the Orange County Supervisor of Elections. Recounting started Nov. 12 in Orange County. Some supervisors of elections, like in Palm Beach County, say it’s unlikely they will finish in time. “These counties are working as hard as they can and no voter should be disenfranchised because they live in a county that happens to be very populated,” he told reporters shortly after filing the lawsuit in federal court. The campaign is suing the secretary of state, governor, state canvassing board and other cabinet members. The court has asked for a telephone conference with both parties in the case. It’s the latest lawsuit in Florida’s too-close-to-call Senate race pitting Nelson against Republican Governor Rick Scott. Nelson’s campaign has filed lawsuits asking for mail-in ballot deadline extensions, a suit that challenges the state’s signature matching policy and another lawsuit seeking clarification over voter intent. Broward County's embattled elections supervisor said on Tuesday she may not seek another term in office. Over 10,000 so-called "over-under" ballots have been identified by the Miami-Dade Elections Department in the course of a recount for three state races ordered by the state of Florida, Miami-Dade Mayor Carlos Gimenez said on Tuesday. "Over-under" ballots are those where someone either filled in two or more blanks, or left the question blank entirely. 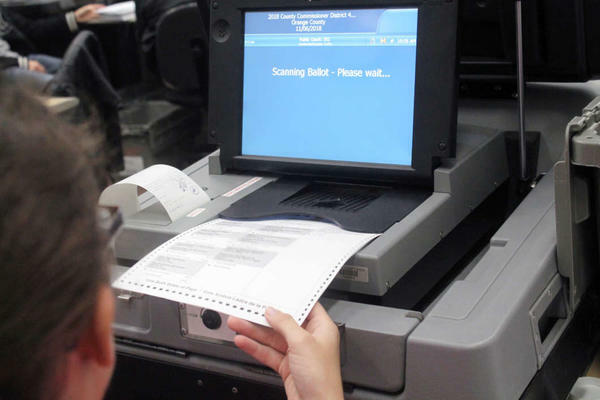 If a manual recount is ordered by the state after the machine recount that is currently under way, those ballots will be reviewed and possibly tabulated. Why Is Miami-Dade So Far Ahead Of Broward County's Recount? It was noon on Monday and Miami-Dade County was about halfway done with its ballot recount for last week’s elections. Yet next door, in Broward County, the official recount hadn’t even started yet.